Predatory fish are well aware of the problem: In a swarm of small fish it is hard to isolate the prey. A similar situation can be found in the microcosm of atoms and molecules, whose behavior is influenced by “swarms” of electrons. In order to achieve control over single electrons in a bunch, ultrashort light pulses of a few femtoseconds duration are needed. Electrons are extremely fast. In atoms and molecules they move on attosecond timescales . An attosecond is only a billionth of a billionth of a second. With light pulses that last only a few femtoseconds down to attoseconds it is possible to achieve control over these particles and to interact with them on the timescale of their motion. These short light pulses exhibit strong electric and magnetic fields influencing the charged particles. A femtosecond lasts 1000 times longer than an attosecond. In molecules with only a single electron, such as the hydrogen molecular ion and its isotopes, their control with such light pulses is relatively easy and was demonstrated by Kling et al. [2, 3]. These first studies on controlling electrons in molecules with waveform controlled light pulses sparked, however, the question, whether the steering of electrons in more complex systems is feasible. In our recent work  we have now managed to control and monitor the outer electrons from the valence shell of the complex molecule carbon monoxide (CO) utilizing the electric field waveform of laser pulses. Carbon monoxide has 14 electrons. With increasing number of electrons in the molecule the control over single electrons becomes more difficult as their states lie energetically very close to each other. Control of the electric field waveform E(t) = E0(t) cos(ωt + φ), with envelope E0(t), and frequency ω, is achieved by stabilization and control of the carrier envelope phase (CEP) φ and constitutes a new paradigm of coherent control that can be applied to steer electrons in atomic and molecular systems . We used visible (740 nm) laser pulses with only 4 femtoseconds duration. The control of electron dynamics in the system was experimentally determined via an asymmetric distribution of C+ and of O+ fragments after the breaking of the molecular bond. The measurement of C+ and O+ fragments implies a dynamic charge shift along the molecular axis in one or the other direction, controlled via the CEP of the laser pulse. Theoretical methods based on ab initio quantum mechanics were developed for multi electron systems and applied to analyze the ionization and subsequent electron localization process. 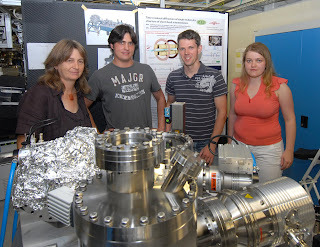 The femtosecond laser pulses initially detached an electron from a CO molecule. Subsequently the electron was driven by the laser field away from and back to the ion, where it transferred its energy in a collision. The whole process takes only ca. 1.7 femtoseconds. The collision produces an electronic wave packet which induces a directional motion of electrons along the molecular axis. The excitation and subsequent interaction with the remaining part of the intense laser pulse leads to a coupling of electron and nuclear motion and gives a contribution to the observed asymmetry. From theoretical analysis it became clear that in the performed experiments, it was also possible to image the structure and form of the outer two electron orbitals of carbon monoxide via the ionization process. 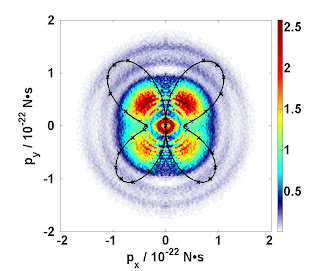 The extremely short femtosecond laser pulses allowed to explore this process in the outermost HOMO (highest occupied molecular orbitals) and HOMO-1 orbitals. The ionization of the molecules is found to take place with a distinct angular dependence with respect to the laser polarization direction. This dependence is seen in fragments from the dissociation following ionization (see Fig. 1 for recorded C+ fragments). Our observation is in good agreement with theoretical calculations (shown as black line in Fig. 1) . The ionization process itself also gives a contribution to the observed asymmetry, which strongly depends on the duration of the laser pulses . Fig. 1: The detachment of electrons from carbon monoxide molecules by femtosecond laser pulses leads to a characteristic angular distribution of the molecular ions and their fragments. The angular distribution resembles the structure of orbitals from which electrons have been ionized. The figure shows the angular distribution of C+ ions measured in the laser-induced dissociative ionization of CO via velocity-map imaging (VMI) for CEP = Π. The laser polarization is vertical and the number of observed ions is displayed in color. Electrons are present in all important microscopic biological and technical processes. Their extremely fast motion on the attosecond timescale, determines biological and chemical processes and also the speed of microprocessors – technology at the heart of computing. With their experiments the researchers have made a further, important step towards the control of chemical reactions with light. The results are also related to basic research on lightwave electronics  aiming at computing speeds on attosecond timescales. M. F. Kling, and M. J. J. Vrakking, "Attosecond Electron Dynamics", Annu. Rev. Phys. Chem. 59, 463 (2008). Abstract. M. F. Kling, Ch. Siedschlag, A. J. Verhoef, J. I. Khan, M. Schultze, Th. Uphues, Y. Ni, M. Uiberacker, M. Drescher, F. Krausz, M. J. J. Vrakking, "Control of Electron Localization in Molecular Dissociation", Science 312, 246 (2006). Abstract. M. F. Kling, Ch. Siedschlag, I. Znakovskaya, A. J. Verhoef, S. Zherebtsov, F. Krausz, M. Lezius, M. J. J. Vrakking, "Strong-field control of electron localization during molecular dissociation", Mol. Phys. 106, 455 (2008). Abstract. I. Znakovskaya, P. von den Hoff, S. Zherebtsov, A. Wirth, O. Herrwerth, M. J. J. Vrakking, R. de Vivie-Riedle, M. F. Kling, "Attosecond Control of Electron Dynamics in Carbon Monoxide", Phys. Rev. Lett. 103, 103002 (2009). Abstract. E. Goulielmakis, V. S. Yakovlev, A. L. Cavalieri, M. Uiberacker, V. Pervak, A. Apolonski, R. Kienberger, U. Kleineberg, F. Krausz, "Attosecond Control and Measurement: Lightwave Electronics", Science 317, 769 (2007). Abstract.